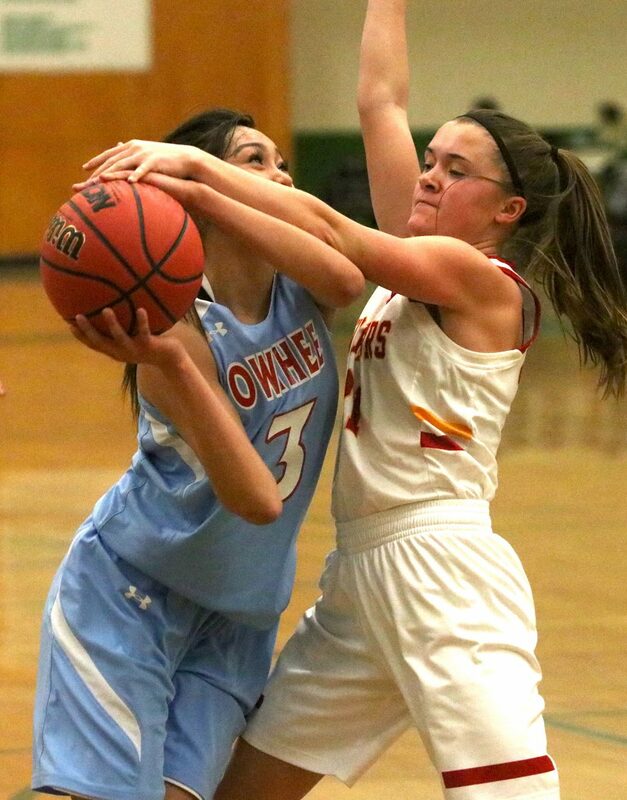 Whittell's Anna White blocks an Owyhee shot Thursday. The South Tahoe and Whittell boys each advanced through the quarterfinals in their respective Nevada Interscholastic Activities Association basketball league championship tournaments Thursday and will play today to reach the title game. Incline High’s boys and girls each received a first-round bye and both will also play today in the semifinals. The Whittell Lady Warriors enjoyed their most successful season in ages, but their season came to an end with a 51-31 loss to Owyhee in the 1A quarterfinals. No. 5 South Tahoe won the rubber match against No. 4 Dayton 34-24 late last night in the 3A Northern League tournament at North Valleys High School in Reno. The Vikings lost at Dayton 51-46 in overtime in December before coming back to beat Dayton 38-31 in overtime in January. 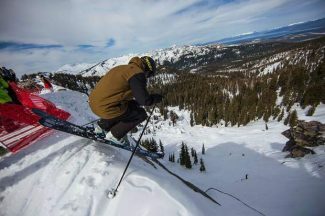 South Tahoe (11-11) will have the unenviable task at 8 p.m. of trying to slay the giant, No. 1 Elko (22-2). The Vikings have played the Indians twice and both results were not close. Whittell beat Eureka in the first round of postseason for the fourth straight year Thursday. The Warriors (20-2), the No. 2 seed in the West, beat the Vandals, the East’s No. 3 seed, 59-48 in the quarterfinals of the 1A East-West regional tournament at Hug High School in Reno. Whittell will face the East’s top seed, Jackpot (19-5), at 4:55 p.m. today at Wooster High School in Reno. Jackpot knocked out the West’s No. 4 seed Pyramid Lake 58-35. Pyramid Lake a couple weeks ago handed Whittell, and head coach Phil Bryant, one of the program’s toughest losses in seven years. That was after the Warriors handled them, 77-52, just like Jackpot in the first round. By comparing common opponents, the game could be close. The No. 2 Incline Highlanders boys’ and girls’ teams play this afternoon in the 2A championships at Sparks High School in Sparks, Nev. The Lady Highlanders will play a rubber match with No. 3 Battle Mountain with a state playoff berth on the line. The top two teams from each tournament qualify for their respective state tournaments next week. Incline (19-4) suffered a big 48-19 loss to Battle Mountain (21-6) Jan. 31 after edging the Longhorns in their first meeting (53-51). Tip-off is at 3 p.m. The Incline boys will also have to try and stop Battle Mountain who has built some momentum over the past couple of days. The Longhorns defeated White Pine on a tournament play-in game to earn the No. 6 seed. They came right back Thursday and knocked out No. 3 Battle Mountain 58-53 in overtime. The Highlanders (21-6) finished the season with 10 straight wins and claimed a share of the Northern League championship. They won’t be afraid of the Longhorns (15-14) after beating them by 29 and 24 points, respectively, earlier this season. Tip-off is at 4:40 p.m.